Six months after van Gogh sold his first painting, he shot himself. The gifted if disturbed artist couldn't live with his belief that selling his art would eventually rob him of his gift. Three centuries later, society still romanticizes the starving artist with the same blind eye to reality as it views the prostitute with the heart of gold. Indeed, conventional wisdom expects the artist to follow the muse, not the money. That the muse doesn't pay the rent, buy supplies, or send the kids to college may be unfortunate, but it is the price one pays for the gift of talent. It is also unfortunate, believes Sebastopol artist Warren Bellows, that many artists are as tied to the myth that an artist must remain unsullied by the marketplace as the public is. "Marketing is about figuring out how I get people to see and understand my art," says Bellows. "As an artist, I spend my time caring about if I have the right color shade. As a marketer, on the other hand, I have to care if other people value what I am doing. That's a whole different question--and a frightening one for most artists." Bellows lives in an idyllic setting in the hills of Sebastopol. The gardens that surround his home reflect his love of beauty as do his Nature Meditations--small, oil-painted ruminations on North Bay locales that have struck his soul. Bellows is particularly attuned to the conflict between marketing and art. Long before he committed himself to painting full time, he was vice president of marketing for Celestial Seasonings. "The problem with marketing art is that it requires an artist to see his paintings as products. This is incredibly difficult for most artists to do. A typical conversation may go something like, 'My art is an expression of my soul; if I let it become a commercial product, then I am selling off my soul, or at least bastardizing it.'" And in some cases, Bellows allows, that may happen. "Though galleries are a great avenue to show your work, one drawback is that there is a tendency for the seller to want to 'brand' the work. No artist who is artistically ready to try something new enjoys being told 'Keep doing florals--they sell really well' or 'Don't change the color scheme.' You get put into a creative box, and your art can start dying in order to maintain commercial acceptability." On the other hand, Bellows says, the objection to marketing may be based on a less lofty principle than preserving one's artistic standards. Just like the rest of us mortals, artists don't like criticism. "I think a lot of artists are just afraid of putting themselves out there and having to deal with a lot of criticism. So one of the ways you make sure you never get criticized is to never put your art out there." That kind of attitude drives publicist Pam Hamilton crazy. Her public relations firm promotes many of the North Bay's major art events, including Marinscapes and the Mill Valley Art Festival. She spends a good amount of her time trying to convince artists they don't have to abandon their muse to make some money. "I tell them over and over, if you want to continue to put your work under the bed with a 'Not for sale' sign, fine. If you want to make a living with your art, learn to market it, not just create it." For as little as $50, she says, artists can put together a press kit that will attract enough attention to get them a mention in the local newspaper. It's not much, but it's a start. Hamilton's pragmatic approach is markedly different from that of Susan Cummins, former board member on both the California and Marin art councils. As owner of the Susan Cummins Gallery in Mill Valley, she ran interference for artists whose talent far exceeded their business sense. Cummins believes an artist's urge to create calls as strongly as that of the doctor, scientist, or priest--none of whom, she points out, are expected to be marketing mavens. At her gallery, if there was marketing to be done, she did it. Cummins' gallery was known for featuring some of the most provocative art in the North Bay over the gallery's 17 years of life. She is still contemplating her next move since closing the gallery early this summer but knows it will be supportive of improving the status of the arts in our society. "Artists are the seekers in our society," Cummins says. "They spend days and hours and months and years by themselves in their studios trying to make a visual image for us of where we are. They are extremely important parts of our society. "The term 'marketing' is so misleading," she continues, "so about the greed of the customer and the creating of psychological need for something you don't actually need. I just think that marketing is somewhat of an over-exercised part of the American psyche. Art is about a unique vision, not something that can be reproduced over and over like a Mercedes." In any event Cummins says, artists can conjure up marketing plans until Picasso's bulls come home, but until America starts attributing the same value to art that it does to Monday Night Football, artists will always be selling to a bear market. "In order for people to respond to any marketing of art, they have to have some kind of interest or education about art. I don't think a lot of people in this country even really look at art as something you should pay attention to. It's hard to market to someone who's not even interested," she says. There are reasons art appreciation has never been a quick study in America, Cummins says. Government subsidies for the National Endowment for the Arts are actually less than they were when the NEA was first formed 60 years ago. Art education is often the first item to be cut from the school curriculum. The undervaluing of art in our major institutions has produced a population that if not ignorant of, is at least sadly intimidated by the world of art. Photographer and mixed-media artist Susan Homes Schwartzbach came to the United States over 30 years ago from England. She is still surprised by the difference in the attitude toward artists here compared to that in Europe. She's heard "Anybody can take a picture, you just point the camera" more times than she cares to remember. A graduate of the California College of Arts and Crafts, she is currently a student in the master's program in art history at Dominican College. She has shown her photographs and mixed-media collages at a variety of Bay Area galleries and just recently completed designing her first website. In between, she has raised a son and supported her husband in his business. "It's hard to make a nonartist understand that one's art is very much a part of oneself, almost an extension of yourself. Nonartists are often unaware of how connected serious artists are to the work they produce. This doesn't mean they wouldn't like to sell their work, but [they] hope that they are able to do so without compromising their vision. It's really hard to draw that line between being commercially successful and still maintaining your integrity." Her bottom line, she says, is that marketability doesn't dictate whether she works as an artist. "I will always be driven to create. It's just part of who I am." The advent of the web and the increasing ease with which artists can build galleries online is making it easier for them to come to terms with selling. It's not a move all are comfortable with, but, as witnessed by the number of new artists' websites appearing on the web daily, many are at least experimenting with the process. 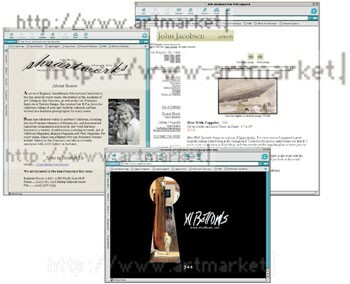 One of the first artists to reach out via the web was East Bay artist John Jacobsen (www.johnj.com). Jacobsen says he guesses a few hundred thousand people have at least glanced at his site since he opened it in 1994. "Most of these viewers sail away immediately, but every few days someone far away will spend a nice, long chunk of time looking at my work." Both Bellows and Homes Schwartzbach have recently launched websites featuring their artwork (www.wbellows.com and www.shsartworks.com, respectively). Both see the web as a valuable tool for getting exposure for their work. For Bellows, the web employs what he considers the best form of marketing: word of mouth. With the push of a button and a well-developed electronic address book, Bellows has been able to announce his newest projects to friends, family, acquaintances, and business contacts. With a request that they pass on the web address if they like what they see, the outreach is impressive. A website provides a platform where artists can talk about their vision, brag about their awards, tell the story of their lives, share a favorite piece of poetry, announce gallery openings, and even invite discussion via e-mail on the meaning of their work. Bellows has sold paintings, primarily large landscapes, through traditional shows. But he likes the variety of ways the web offers to showcase his art. Presently, his website includes a show of his Nature Meditations, a discussion of the technique he uses to create the paintings, and a section called "Animated Journeys" that uses animation to draw a viewer into a changing landscape. The "journeys" featured will change over time, Bellows says, and hopefully keep people coming back to the site. Both artists acknowledge that there are drawbacks to publishing art online. Bellows says it's painful to see a color he has worked to bring to its purest form lose some of its power on the computer screen. Homes Schwartzbach says her web designer suggested that she put her photographs and mixed-media collages on the web, but for now she's limiting the online gallery to her art cards. "I question whether the characteristics which make a piece unique would be adequately depicted on the web," Homes Schwartzbach says. "The ability to fully appreciate those qualities is obviously more of a factor for someone interested in buying an original piece of art as opposed to someone who is spending a few dollars on a card." Bellows doesn't think established artists should be wary of the web. "It gives a way for the public to keep in touch with the artist's work in between shows and fairs. Clients can keep in touch with new works even if they can't make it to a gallery opening that is 10 states away. The web is a glue, a link from artist to customer or admirer." Homes Schwartzbach has had shows through the Marin Arts Council and at the San Francisco Women Artist Gallery. She is presently showing her art at the American Crafts Cooperative Inc. in Berkeley, and recently contracted with Sur le Table for a series of art cards featuring her photographs. She agrees with gallery owner Cummins that the best conversation about art occurs in real time--in the museum, studio, or gallery--but she also knows that most people don't have the time or inclination to visit galleries or may be too intimidated to approach an artist once there. She likes the idea of a website because it offers a chance to have a dialogue (via e-mail) about her art with someone who is entirely new to her audience. Sales aside, it is the possibility of sharing their art with an audience as vast as that provided by the web that has proved irresistible to both artists. With his Nature Meditations, Bellows is able to engage in very personal conversations with viewers about the emotions evoked by the beauty of Sonoma County--shared memories of a landscape breaking through an early morning fog, the strong shape of the dark trees on the gold hills, the rosy light of late afternoon, the undulation of the land, the relationship of the water against the rocks. When one of his Meditations strikes a chord with a viewer, he knows the two are sharing a moment heretofore experienced only individually. "There's nothing quite like the feeling of gratification you get when you know a piece of your work has become part of someone's life," says Homes Schwartzbach. "I get calls from people who tell me that the photograph I took of their child many years ago has become a treasured possession. That kind of reward is really priceless." While she doesn't discount the power of the web, Cummins believes it still lacks the intimacy required to bring artists and patrons together successfully. Patronage requires "establishing a very intimate rapport between the sensibility of an artist and the viewer. . . . The only way you do that is by very personal, very educationally oriented conversation--literal conversation." Cummins doesn't actually say she is afraid the web will play into the hands of the "pretty picture" folks--such as nostalgia artist Thomas Kincaid--but she does sound a warning: "The really great and puzzling artworks were often problematic in their time, but in retrospect we look at them and we 'get it' long after the work was done. "The only thing I can hope is that the people who are buying the Thomas Kincaid school of art today will eventually figure out that they only have an appeal for a certain time, like the big-eyed Keene paintings. If the buyer has the intention of educating themselves, then the Thomas Kincaid will become insipid, like a sugar high: you get a rush, but it doesn't last." And, she grants, perhaps the web will introduce people to a wider variety of art in a less intimidating venue than a gallery or museum. In the end, Bellows says the web is simply another way to make art more universally available. It is one more medium by which artists can pursue their muse. But it will not resolve the conflict between the very private act of creating and the public act of marketing. "The really big question for me now is how can my art and my marketing efforts have integrity, i.e., be a truthful expression of myself. I am currently very engaged with that question. "I am not sure I have the answer, but I hope to never forget the importance of that question." From the September 19-25, 2002 issue of the North Bay Bohemian.